This is the final entry in the XMM Launch Campaign journal series, which ran from November 1999 until shortly after the launch in December 1999. The journal covered the main activities during this period: from shortly after the shipment of the spacecraft to the launch site in Kourou, through the final integration of the spacecraft with the launcher, to the launch of XMM (renamed XMM-Newton in February 2000). Broadcast live around the world, via satellite television and webcasts on the Internet, the launch of Ariane 504 carrying ESA's XMM X-ray space observatory was a text-book mission. A faultless, uninterrupted countdown allowed the Ariane-5 to lift off precisely as scheduled, at 14:32 GMT (15:32 CET). 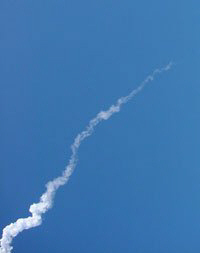 A billowing trail of smoke in a clear blue sky, and XMM was off. Twenty-nine minutes after liftoff, the satellite was released into space with an exceptional accuracy. Post launch data showed that it had been injected to within 1.5 km of its target, on an orbit with a perigee of 825.6 km and an apogee of 113 946 km. This accuracy, reducing the amount of propellant the spacecraft will have to use to reach its final orbit, led XMM Project Manager Robert Laini to say that XMM's in orbit life could, if all goes well, reach 20 years, instead of the expected ten. Some twenty seconds after XMM's release, its first telemetry was received by the ESOC Mission Control Centre in Darmstadt Germany. The Villafranca ground station had locked on to the launcher's own telemetry, and so immediately picked up the satellite's signals when it was released as it passed over the Middle East. During the three minutes passage within visibility of the Villafranca antenna, before XMM passed below the horizon, the ESOC teams were able to confirm that everything was operating as planned onboard the satellite. This first acquisition was announced live by Alan Smith, Flight Operations Manager, during the public event held at ESOC. Over 300 people packed the auditorium and their applause was unrestrained at separation from the launcher and when the acquisition by Villafranca, and later by the Perth tracking station were announced. slice of the XMM cake. The school children present for the ESOC show, who had been able to put their questions about XMM to the scientists, also greatly appreciated the excitement and joy of this successful launch. And the celebration cake, in the shape of XMM, was greatly appreciated! "The launch of XMM represents a success for Europe. We are very proud of our satellite, and of the Ariane-5 launcher. The flight has further demonstrated the potential of the new vehicle and we expect more successes of this kind. So you understand we really are proud to have been on this first Ariane-5 commercial launch." "The work is now up to us. We must be sure that the scientific community will soon be able to use this satellite. There is a very strong demand for its science data that will complement that of NASA's Chandra observatory." "The construction of this new spacecraft has led us to develop new technologies which place Europe today at the forefront of space science. It is an achievement we can be proud of. And I would like to deeply thank Roger Bonnet, ESA Director of Science, Robert Laini and all those involved in the XMM project for their hard work." "It was an incredible launch, it went so well. For XMM now, it is the beginning of a new story."